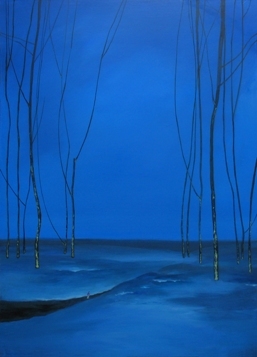 Currently showing in a homely setting, paintings by a new artist focus on strange and dream-like landscapes. Tomoko Ashikawa, one of Waitingroom gallery’s creators, notes that “people who want to come here really need to search for it.” Located in fashionable Sangenjaya, the new space is part book shop, part café and part home. It has an intimate and inviting feeling precisely because it is not a white cube. Here you feel as if you can see things in context; the art becomes more accessible as a purchase option when already displayed in a home space. You may also find yourself being offered a chair, a chat and a cup of tea or coffee. 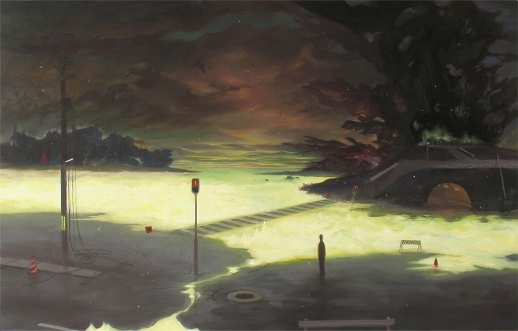 Currently showing is “Worlds”, the first solo show by emerging artist Hiroshi Yoshida. He is young, fresh (only twenty and still a student at Kanazawa Art College) and although little known at the moment, his work is intriguing. Yoshida first exhibited at the Shinjuku Art Infinity competition held at Marui, where he came to the attention of gallerists. The work is surreal, fusing familiar objects and landscapes in an uncanny and haunting style. Yoshida states that the connection between reality and memory is fluid and changes as we interpret both, like in the piece ‘Pool’, which depicts a familiar place in a surreal way. Think Edward Hopper and Dali’s version of ‘The Night Before Christmas’ – set in Japan. The technical aspects of the work are good – he is no amateur when it comes to draftsmanship. Painting mainly with acrylics, he creates landscapes that are believable but which seem off-kilter, as if the image is a reconstruction of a place visited before. He succeeds in creating paintings that simultaneously evoke a sense of real and dreamt space fusing to create something that is neither. 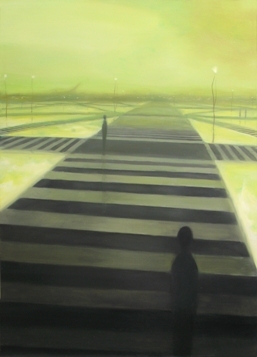 The piece ‘Cross Point’ shows a familiar Japanese crossing, but it extends into infinity amid a strange yellow mist. These paintings are narrative, they are full of theatricality – but not the kind that builds up to a climactic finish, rather as if the event has already taken place and is part of a continued story. ‘Snow Field’ is a particularly beautiful blue, a winter scene complete with snow and stark trees, but tucked into the painting is a small figure walking. This attention to detail changes the image from being merely a landscape to becoming the scene of some kind of action. A closer viewing of the works reveals small details and nuances which are not at first obvious. 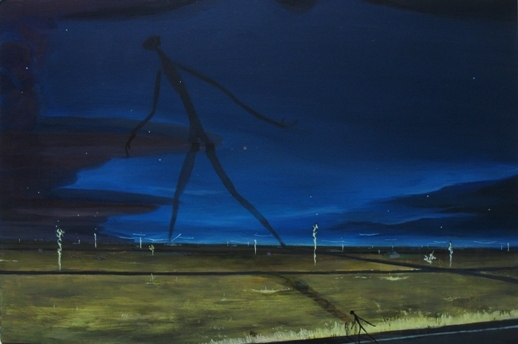 The stark lemon yellow which causes the stick figure’s shadow to become looming in the painting ‘A Man in a Hurry’ is from an unknown source and the shadow is cast onto the sky. In ‘Faraway Thunder’ the scene is quiet as if some catastrophe has taken place and we are looking at the aftermath. Yet these are also painterly pieces – the colors are beautiful and the works have a sense of balance and composition. This show is a great chance to check out the new space and enjoy the works of an artist who will, no doubt, be making his mark in the future.